Hannover, March 5, 2010 – Xen, Intel, AdBlock, Google Android, OpenStreetMap, and Linux kernel programmers were winners of the 10th annual Linux New Media Awards, presented last evening at the CeBIT 2010 conference in Hannover, Germany. 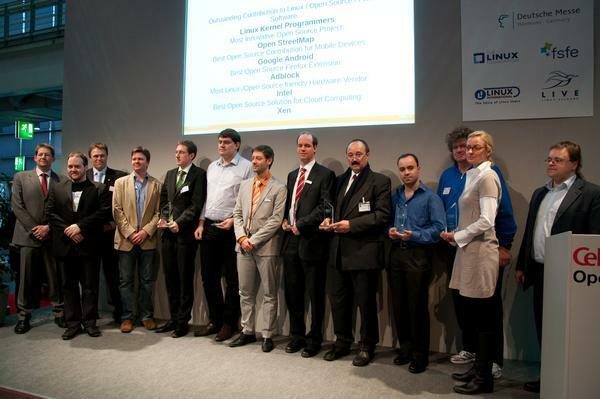 A jury of approximately 300 experts from the open source community nominated the candidates for the prestigious award. An award panel consisting of members of the open source community, authors, journalists, agencies, and industry representatives selected the winners. Among the panel members were the prominent kernel hacker Alan Cox, Linux International director Jon 'maddog' Hall, Linux author Michael Kofler, open source veteran Bruce Perens, Ubuntu founder Mark Shuttleworth, former openSUSE community manager Joe "Zonker" Brockmeier, and Joe Casad, editor in chief of Linux Pro Magazine and Linux Magazine (international English edition). Kai Dupke, senior product manager at Novell responsible for Linux, presented the award to the founder of the Xen project, Keir Fraser. Xen enables running multiple virtual machines on a single host. Xen began at Cambridge University and is being further developed primarily by Citrix. For the second year the award for Most Linux/Open Source-friendly Hardware Vendor went to Intel, which is not only actively involved in Linux kernel development, but also intervenes in favor of open standards. Rico Barth, chairman of the LIVE Linux association in Germany and managing directory of C.a.p.e IT GmbH, handed the award to Wolfgang Rosenberg, business development manager of EMEA at the Intel Software and Services Group. Winner in this newly established category was the AdBlock extension, created by Wladimir Palant. Presenting the honor to Palant, who made a special trip from the Netherlands to accept the award, was Mozilla director of special programs Chris Hofmann. The software platform for smartphones, mobile phones, and netbooks was honored for its breakthrough with Android version 2.0 over the past year. Knoppix founder Klaus Knopper handed the award to Ines Wesner, who accepted on behalf of Google Android developers. Linux Magazin's Markus Feilner didn't deny himself the honor of conferring the Most Innovative Open Source Project award on a project that he has been following with some interest over the years. OpenStreetMap is a wiki project that generates a free world map that can be embedded without licensing fees in print, webpages, and applications such as navigation software. Sven Anders, a project and community member since day one, accepted the award. The highpoint of the award ceremony was the award presented by Jim Zemlin, executive director of the Linux Foundation, to the Linux kernel programmers. Representing the developer community and receiving the award was Hans-Joachim Picht, who has been working on furthering Linux platform development at the IBM Linux Technology Center in Boeblingen, Germany since 2006. All award speeches and ceremonies were streamed live over the Internet from Techcast GmbH, and the live streaming video archives will be available soon on the Linux Magazin (German) and Linux Pro Magazine sites. Linux New Media AG, founded in 1999, is currently the largest worldwide content provider for Linux and open source. The publishing house provides more than 30 print and online publications and has offices in five countries. In addition to Linux Pro Magazine, Linux Magazine, and Ubuntu User, Linux New Media AG produces German titles such as Linux Magazin, Linux Technical Review, LinuxUser, Ubuntu User, and EasyLinux, as well as independent editions in Spain, Poland, and Brazil. Linux New Media AG organizes events and conferences such as "CeBIT Open Source" and the "LinuxPark" series in Brazil.